Factory Sealed 2016 Topps Series 1 Baseball Hobby Box mit 36 Packs Per Box, 10 Cards Per Pack. 1 Autogramm oder 1 Relica Card per Box. Dazu 2 Vintage Stamped Buyback Cards per Box !! 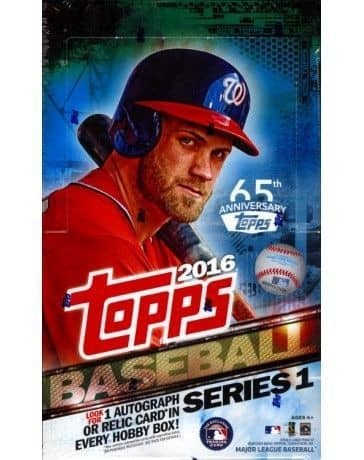 Produktinformationen "2016 Topps Series 1 Baseball Hobby Box MLB"
Factory Sealed 2016 Topps Series 1 Baseball Hobby Box mit 36 Packs Per Box, 10 Cards Per Pack. 1 Autogramm oder 1 Relica Card per Box. Dazu 2 Vintage Stamped Buyback Cards per Box !! The 350-card base set is back, featuring contemporary stars, future greats, and newly debuting rookies. Collectors, both current and returning, will also find all-new inserts, autographs, and relics highlighting great moments in MLB and Topps history, as well as commemorating the modern-day stars and their achievements. Topps is celebrating 65 years of making baseball cards this February with the release of 2016 Topps Baseball Series 1. Some 2016 Topps Baseball packs will include specially stamped buybacks to mark this great anniversary. The buybacks cards will span seven decades, and include some of the greatest baseball players of all time. Join us and rediscover what makes Major League Baseball , Topps Trading Cards, and collecting great! - Gold - Sequentially numbered to 2016. - Vintage Stock - Sequentially numbered to 99. Berger's Best: 65 cards celebrating the legacy of Topps' progenitor, Sy Berger, with an iconic card reproduced from each year since 1952. Inserted 1:4. Perspectives: In 25 cards, collectors will gain a new perspective on the game and the highlighted player. Inserted 1:4. Pressed Into Service: When their teams needed them the most, these 10 position players ventured into unfamiliar territory and took to the pitcher's mound. Inserted 1:8. 100 Years at Wrigley Field: 25 of the most memorable Chicago Cubs moments at The Friendly Confines are immortalized on cardboard. Inserted 1:8. Back-to-Back: 15 of the greatest power hitting combos grace these cards. Inserted 1:8. First Pitch: This fan favorite set returns showcasing notable names who tossed out the first pitch at a 2015 MLB game. Inserted 1:8. COMMEMORATIVE RELIC CARDS: 1 Per Hobby case! Team Logo Pin CARDS: High gloss metallic pins featuring 35 players alongside their team logos. Team Logo Pin autograph CARDS: Numbered to 25. No-Hitter Pin CARDS: 15 remarkable achievements in pitching are lauded with special pins created solely for this set. No-Hitter Pin autograph CARDS: Numbered to 25. World Series Coin and Stamp Cards: Cards featuring champions of the Fall Classic and a U.S. coin and postage stamp from the year they won the title. - Quarter with Stamp and Autograph - Numbered to 10. Berger's Best Autograph Relics: Numbered to 10. Topps Laser Autograph Relics: Numbered to 10. Back-to-Back Dual Autograph Relics: Two autographs and two relics per card! Numbered to 10. Pressed Into Service Autograph Relics: Numbered to 10. 100 Years at Wrigley Field Autograph Relics: Numbered to 10. Glove Leather Autographs: Players sign directly onto simulated glove leather. Numbered to 25. Scouting Report Autographs: Discover what the scouts are saying about some of the most collectible MLB superstars alongside their autographs. BERGER'S BEST Autographs: Numbered to 25. Back-to-Back Dual Autographs: Numbered to 25. Pressed Into Service Autographs: Numbered to 25. 100 Years at Wrigley Field Autographs: Numbered to 25. World SERIES Champion Autographs: Numbered to 50. Postseason Performance Autographs: Numbered to 50. BERGER'S BEST Cut Signatures: Numbered 1/1. Scouting Report Relics: Discover what the scouts are saying about some of the most collectible MLB superstars alongside their uniform or bat relics. Berger's Best Relics: Numbered to 99. Back-to-Back RELICS: Numbered to 99. Pressed Into Service Relics: Numbered to 99. 100 Years AT Wrigley Field Relics: Numbered to 99. - Bunt Code Cards - Featuring a code to be redeemed for currency to be used within the Topps BUNT App. - Bunt Player Cards - Unlock special cards only available through the codes printed on these cards. 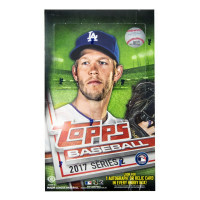 Weiterführende Links zu "2016 Topps Series 1 Baseball Hobby Box MLB"
Fanbewertungen für "2016 Topps Series 1 Baseball Hobby Box MLB"